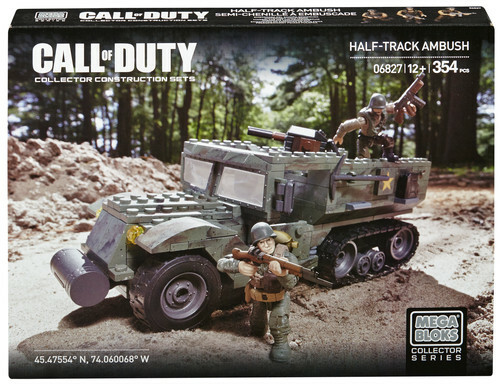 The Half Track Ambush features an iconic World War II military vehicle built for cross-country troop infiltration where roads may not lead. This buildable half track transport measures 8.8 L x 3.6 W x 3.7 H in inches, is armed with a forward-facing roof cannon and equipped with real working treads and rubber tires, doors that open and shut, authentic windshields, and can carry up to nine soldiers. Recreate legendary scenes of Allied troops breaking through enemy lines and surprising the enemy on their own turf. The Half Track Ambush comes two extremely poseable micro action figures – a four-star Allied general and his loyal soldier – and highly detailed, authentic interchangeable accessories and weapons.